NEWTOWN SQUARE, Pa. – For players and caddies on the PGA Tour, this is an important stretch. On the heels of the year’s final major, the PGA Championship, there are four big-money FedEx Cup Playoffs events that offer the dangling carrot of a $10 million winner’s bonus. For those fortunate to earn a nod, the 42nd Ryder Cup in Paris awaits at month’s end. Big tournaments. Giant stages. It can be a difficult time of year, as well. On what should be the final day of a long, three-week playoff run, it’s pouring relentlessly in Philadelphia and all along the east coast, which means the BMW Championship will be pushed to a Monday finish. That’s tough to swallow for caddie Paul Tesori, a man who has spent 10 of 13 weeks on the road, away from his wife and young son at home. Life on the road is what caddies do, and it would be worse if Tesori actually felt this was a job. Sure, he’ll have to slog across the soggy fairways of Aronimink Golf Club for a couple more days, but if this is labor, it’s a labor of complete love. “Can you believe it? My 19th season,” Tesori says, taking a break outside the caddie quarters at the BMW after his player, Webb Simpson, finished up a brief practice session. “Crazy how fast it’s gone by. I love what I do. I don’t like what I do; I LOVE what I do. There are some terrific player/caddie relationships on the PGA Tour, many of which have withstood the test of time. Tesori, 46, and Simpson, 33, have a special relationship. As good as the two work together on the course, Simpson said they are stronger off it. That will be a nice asset to have in two weeks, when they are in France representing the U.S. in the 42nd Ryder Cup, their first appearance on a national team since 2014. He’s also amped up because he will do it with Tesori by his side. Having played an “away” Ryder Cup before, in Scotland four years ago, Simpson realizes the crowds are tough and the atmosphere boisterous. A player can get lonely inside those ropes. Tesori earned a PGA Tour card and played one season in the mid-90s, but he struggled with injury, lost his confidence, and got the swing yips. His stint was a brief one, but he understood the game and the swing, and he made his way into teaching. He first caddied in 2000, when Vijay Singh, a Florida neighbor whom he knew well, asked Tesori to help out with his swing, than asked if he’d also man the bag for a few weeks. The two had some nice success together. They also spent so much time together playing and practicing – few players ever logged as many hours practicing as Singh – that it wore on the both of them. In 2003, they were done. Tesori thought that might be the end of his caddie days, too. So he put out a resume and accepted a job as a teller at a bank in Florida (“I love numbers, and that was going to be my new start,” he said.) Six weeks after he and Singh had split, his phone rang. It was Jerry Kelly, and he and Tesori would form a nice partnership. Kelly made it to the 2003 Presidents Cup in South Africa, and Tesori could feel his reputation as an asset grow with their success. As Tesori looks back, he knows it was an important season. “It really cemented my reputation out here,” he said. For Tesori, 2010 would be a life-changing year. He’d been divorced for a handful of years, and his life was feeling empty. That summer he was baptized, and he continues to walk strongly in faith, his Bible always with him when he travels. When he lost his job working for PGA Tour player Sean O’Hair that year, he didn’t have much going for him. He would describe himself as “jobless, homeless and alone” and it wasn’t a good combination. In hindsight, though, maybe there was a bigger inherent purpose. Being stripped of everything helped him to simplify his life and identify what was most important. Tesori never did take the teller job. He was mulling an offer to go to work for Camilo Villegas for the upcoming season. Villegas at the time viewed as a hot up-and-comer who’d emerged out of the same college program, the University of Florida, where Tesori had played in the mid-1990s. He was about four hours from accepting the offer. Funny how life can throw you twists. That’s when another PGA Tour player reached out to him. This player was ranked 213th in the world, and had barely kept his card that season, securing it late. It was Simpson. As the two spoke on the phone, Tesori’s then-girlfriend, Michelle (now Paul’s wife) was on the computer, googling Simpson’s numbers. But after five minutes, Tesori became sold on Simpson. Simpson told him he had hired a team to get in better shape physically, and he was committed to working harder and getting better. Usually, a caddie is pitching a player on what he can bring; this time around, the roles were reversed. They won twice in 2011, and in the summer of 2012, Simpson broke through at the Olympic Club in San Francisco to win his first major, the U.S. Open. When Simpson was named to the Ryder Cup team two months later to play for Davis Love III, Tesori could check all three boxes he’d set out to accomplish when he started caddying: 1. Win any PGA Tour tournament; 2. Win a major; 3. Caddie in the Ryder Cup. Tesori said he had a blast at Medinah in ’12, even though the U.S. watched its seemingly commanding 10-6 advantage into Sunday singles dissolve into a bitter one-point defeat in front of a home crowd in Chicago. “Obviously it lived up to every expectation,” Tesori said. “That was an amazing year, Davis Love was an incredible captain, there was team camaraderie, I liked everything about it. We’d won the U.S. Open that summer, and even though we lost the Ryder Cup, it was still right there with the U.S. Open. Two years later, in Scotland, the experience wasn’t nearly as good. Simpson was a captain’s pick, performed poorly in his opening match, and didn’t see the course at Gleneagles again until the singles, when he halved Ian Poulter. That was a line-in-the-sand year for the U.S., though. Phil Mickelson said what he said about the captain, Tom Watson, in an intense post-match press conference, a U.S. task force was formed to improve how the team would function, and the players got a bigger say moving forward. Since, two U.S. Presidents Cup victories have sandwiched a 2016 Ryder Cup victory at Hazeltine. So far, so good. Simpson and Tesori are excited about the prospects of playing another one overseas. Tesori fills an interesting role with Simpson. Not only does he caddie, but he serves as his ‘swing eyes,’ too. He has looked after his swing since 2013, with the two going to see Butch or Billy Harmon maybe once or twice a year. (Northwestern coach Pat Goss helps Simpson with his vastly improved short game.) So there are a lot of dynamics in play. Why does the Simpson-Tesori pairing work so well? It won’t be the case in Paris, but Simpson and Tesori are the rare tandem that usually rooms together when they’re on the road. Tesori said the chemistry works because the two are so different personality-wise. He can leave a course in the afternoon, take a shower, lie down, order room service and call it an early night. Simpson is always on the move. He needs to be out, doing things, keeping busy. Tesori said Simpson is not able to sit still. When the laughter subsides, Tesori adds this: “I get a lot of credit with Webb, but it really doesn’t have much to do with me. There’s not another man like him. I’ve never met one. He is the best husband I’ve ever met, the best dad I’ve ever met, the most consummate professional I’ve ever met, the best friend I’ve ever had. The guy walks the walk every single day of his faith, and he doesn’t want any credit for it. I’m lucky to be able to be with him each and every day. Tesori has been on Simpson’s bag for eight seasons. His longest stretch with any other player was three. Ten of 13 weeks on the road and away from home can start to wear on a person. Tesori is a devoted family man to Michelle and their son, Isaiah, who is 4 1/2. Isaiah is the light in his life; he just happens to have Down Syndrome. Having learned all he has learned since Isaiah’s arrival in January 2014, Tesori says that even if he could go back, if he could give Isaiah one fewer chromosome, he would not change a thing. He and Michelle started a foundation in 2010, the Tesori Family Foundation, to help out underprivileged children in the Jacksonville, Fla., area, where they make their home. It started out simply enough, with modest funds raised that first year to help provide laptops and educational opportunities to about 20 children. Michelle helps run non-profits for a living. Originally, Paul told her he didn’t want to get involved with a foundation unless he could go all-in. “She told me, ‘That’s lame. If you make a difference in one person’s life, you go from there,’” he said. Since Isaiah’s arrival, helping children has transitioned beyond the homeless and the hungry to assist special needs children and their families, too. Tesori’s favorite events are the All-Star Kids Clinics. He’ll get a Tour player – during Players week, it’s usually Jordan Spieth, who has a younger sister on the autism spectrum – and a few fellow caddies and provide one-on-one instruction to 25 children with special needs. 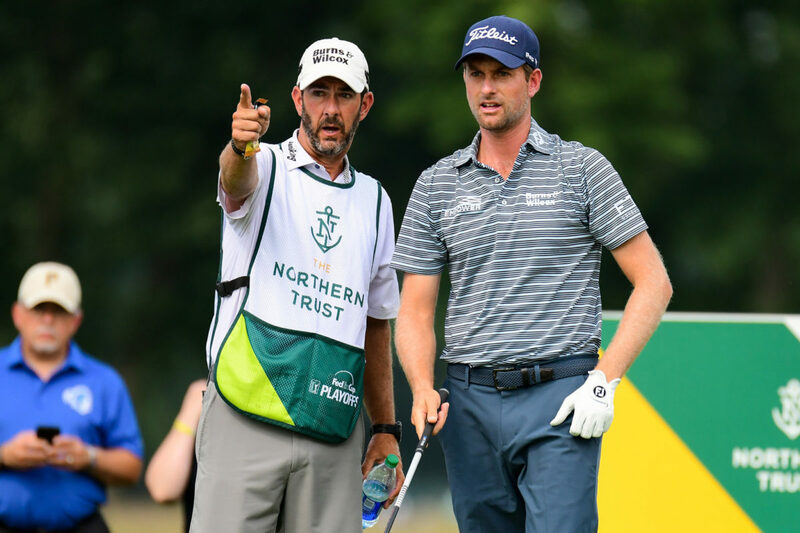 Webb joins him when he does the clinic in Charlotte during the Wells Fargo Championship, and Billy Horschel has lent Tesori a hand at clinics in Greensboro during the Wyndham Championship. Michelle’s favorite have become the Buddy Baskets she assembles to the parents of children who are born with Down Syndrome in North Florida. The baskets are assembled to celebrate the birth of a special child, something Paul says can be forgotten. And speaking of family, the extended Tesori clan was able to celebrate the dominant Players victory Simpson posted at the Players Stadium Course at TPC Sawgrass, which happens to be in Paul’s back yard. Tesori learned the game from a grandfather (Albert Paul Tesori, Sr.) who for years was the starter at Ponte Vedra Inn, not far from where TPC Sawgrass would rise from the marsh and swampy dirt. Tesori (who is Albert Paul Tesori III) can remember hitting shots at TPC Sawgrass’ famed 17th hole before it was even grassed. He guesses he probably has played the Stadium Course 600-700 times, so to win there was incredibly special, to say the least. At the champion’s ceremony, PGA Tour Commissioner Jay Monahan recognized the significance of the moment and made a meaningful gesture. In front of the first row of at the trophy presentation, where dignitaries such as former PGA Tour commissioners Deane Beman and Tim Finchem would sit, Monahan had a set of chairs set up that were filled by Tesori, his wife and son, his daughter from his first marriage, and two of his sisters. As big as the moment was for Simpson, it was extra special for Tesori, too. A moment he will not forget in a career that has been so good to him. Nineteen years and counting. He smiles. Life is good. Children get to experience Wyndham in special clinic with pros!